3north is a Virginia-based design and architecture firm sought after for their IQ (Intangible Qualities) charrettes and cross-disciplinary teams that produce meaningful, resonant hotels, landscapes, interiors and graphic products. 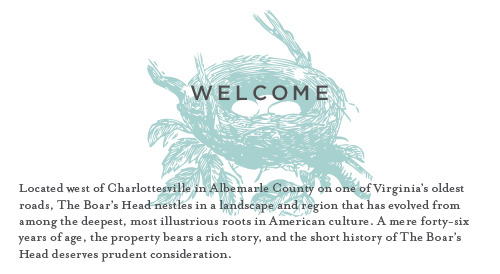 I was commissioned to bring cultural expertise to their project redesigning a 170-room resort in Albemarle County, Virginia. I provided detailed descriptions of the region to inform the renovation of guest rooms, grounds and retail shop, ensuring appropriate selection of materials, products, and marketing copy. I also provided the robust dining services department with a sustainable supply chain template for sourcing from regional producers.